The Emergency First Response Primary Care (CPR) and Secondary Care (First Aid) CourseThe Primary Care (CPR) teaches participants how to respond to life-threatening emergencies. The course focuses on primary care through a combination of knowledge development; skill development and realistic scenario practice to make sure participants have the confidence in their ability to provide care when emergency situations arise. 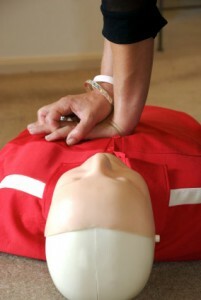 The secondary Care (First Aid) covers injuries or illnesses that are not immediately life-threatening. Participants focus on secondary assessment and first aid through knowledge development, skill development and realistic scenario practice. Maximum course size 12 people. Two multiple-choice question papers and two Knowledge Reviews. On successful completion of the course an Emergency First Response Primary/Secondary Care (plus additional completed skills) certification card valid for two years is issued.